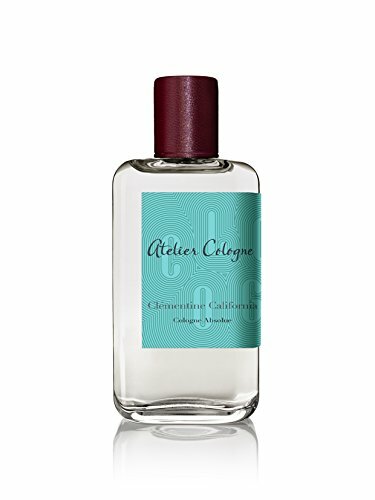 I’d never heard of Atelier Cologne before my trip to New York, but that all changed when got to the airport before my flight. I deliberately arrived early to spend a lot of time in Duty Free trying out fragrances and learning about what I liked and didn’t light. It was super informative, and you can read all about it here. Whilst wandering around the fragrance offerings that Heathrow’s Terminal 5 had to offer, I made a friend in one of the sales assistants in the Tom Ford concession. She became my guide, and was amazing! After a lot of wandering, and me saying l liked this, I didn’t like that, she introduced me to Atelier Cologne. With an array of colour in front of me, I tried several scents, but it was Clementine California that I fell in love with. The presentation is fairly understated. I like the texture on the box, and the juxtaposition of the normal and italic typeface. The former graphic designer in me always appreciates typography. Being a niche fragrance, I went with the 30ml bottle, which was cute, and the turquoise label on Clementine California appealed to me too. I was offered a free leather travel sleeve to go with it, and they had just about every colour to choose from. I stuck with the theme and went with turquoise. Upon spraying this, the first thing I noticed was how light and fresh it is. It’s almost fizzy with citrus. There’s no mistaking the mandarin and Clementine notes in the top giving this a super zesty, tangy feel. The woody base keeps this grounded and the star anise and pepper in the mid add complexity, but without making it heavy or overtly masculine. This is a unisex fragrance that works equally well on a man or a woman. This is one of my all time favourite summer fragrances. I feel energised when I wear it. It’s perfect for hot weather and the sun is shining. Projection is good, not overwhelming. Performance isn’t super long, but I consider this a daytime scent, and wouldn’t want to to last into the evening as I’d probably switch to something more masculine. So all in all, this does everything I need!